The New Hampshire State Council on the Arts announces the seven recipients of the 2003 Governors Arts Awards. 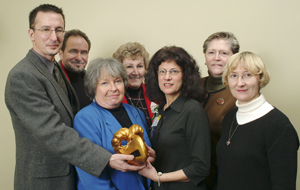 The winners were honored at a gala ceremony at the Concord City Auditorium on Sunday, January 11, 2004, The Governor’s Arts Awards are presented every two years and recognize outstanding accomplishments in arts education, arts patronage, arts support by a town or city, cultural access leadership, distinguished arts leadership, folk heritage, and an individual artist’s lifetime of work. The Governor will presents each recipient with a unique award, designed by a New Hampshire artist. Potters Edwin and Mary Scheier, who rose to national prominence while living and working in New Hampshire, could not attend the award ceremony. 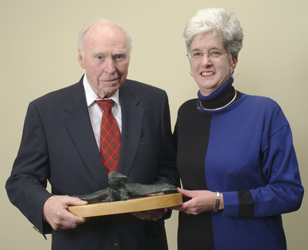 Director of the Currier Museum of Art Susan Strickler, who accepted the Lotte Jacobi Living Treasure award on their behalf, poses with its creator Robert Hughes. 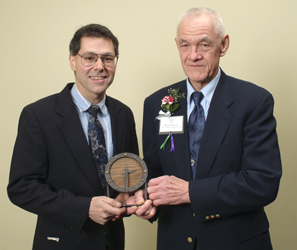 Fly tier Ellis Hatch, Jr. (right) holds a clock, with eagle-feather hands, designed by metal smith Garry Kalajian. Representatives of the Town of Littleton traveled to Concord to receive the Community Spirit Award and met with the award's creator, theatre artist Greg Gathers (far left). 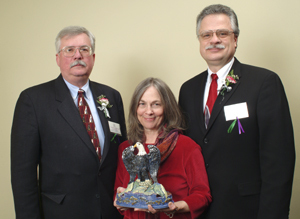 Timberlane Regional High School’s music director Anthony DiBartolomeo (right) and Superintendent Dr. Douglas McDonald (left), pose with artist Kathy Hanson who created the Arts in Education award that was received by the Timberlane Regional School District. 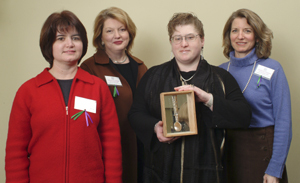 Artist Joy Raskin (holding award) with Denise Doleac (left of center) of the Portsmouth Children's Museum, recipient of the Cultural Access Leadership Award. 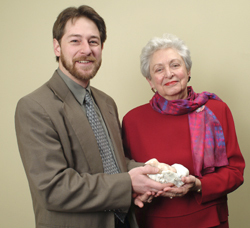 Artist Tim Gaudreau (right) meets Individual Arts Patron award recipient Hilda Fleisher. 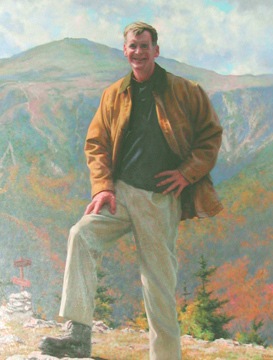 The New Hampshire Citizens for the Arts along with the New Hampshire State Council on the Arts honored Senator Judd Gregg with the State's first Government Leadership on the Arts Award during the 2003 Governors Arts Award ceremony. 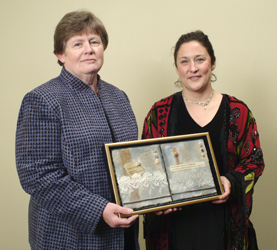 The award, created by artist RP Hale of Concord, New Hampshire, is a gilded calligraphy framed artwork outlining his leadership and accomplishments in support of New Hampshire's arts community. The artists who have been commissioned to create the awards are all juried members of various State Arts Council programs. 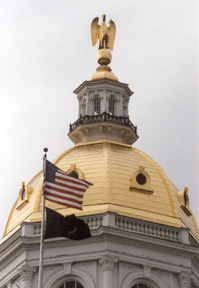 All seven awards will interpret the eagle designed for the dome of the State House, which was installed in 1819.